Traffic was thick in Amsterdam, but except for delivery vans (also small), often a Mini-Cooper was the largest car on the road. Traffic felt more human sized, not so intimidating. When I commented on the size of the cars, a Dutch friend lamented that they are getting bigger. Don’t do as we have done! I wanted to say. My favorite car was this tiny red car, in a photo courtesy here of susieredshoes at Flickr. 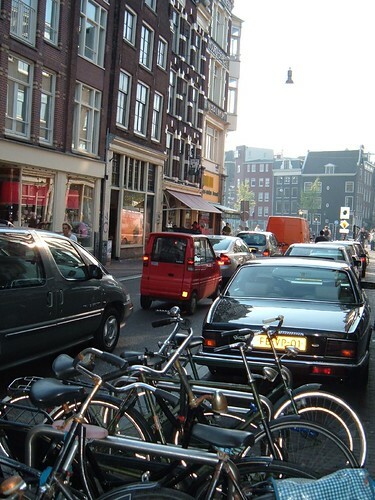 There are almost as many bikes as people (1 million) in Amsterdam. I saw business-suited and high-heeled bikers commuting to work every day, many of them talking on cell phones. Driving cars in the city is officially discouraged through outrageous parking fees and ubiquitous speed bumps on side streets. Biking is encouraged through equally ubiquitous bike lanes. The official way to enjoy Amsterdam is to rent a bike and take your own tour. I detest biking next to traffic, so I passed on that experience, but I’m told that Amsterdam is the safest of the European cities when it comes to accidents. Pedestrians cross every which way, and bikes, cars, and trams race down every arterial street, but no one collides. Everyone looks out for everyone else on the road. 4. Reviving old, environmentally friendly skills and crafts. On my last day in the Netherlands I took a train out to Rhenen and visited an open-air cultural museum near Arnhem. Ordinary buildings such as old farmhouses have been transported to a parklike setting and their interiors restored, with multilingual volunteers in period costume describing the customs and way of life. Organic gardens are grown using heirloom varieties of vegetables, including a leafy green that tasted like a wilder and spicier cousin of spinach. The volunteer on duty in a nineteenth-century farmhouse, who was dressed in long skirts and a small black cap, was stirring it into an omelet in an iron skillet over a coal-burning stove. Outside, handcrafted fences provided a beautiful pasture for a few sheep. I tried to wiggle the fence. It was extremely solid and wouldn’t budge. The farmhouse below, built in the 1700s and occupied into the twentieth century, housed both animals and humans in one great room. The reed roofs of these buildings were amazing—a foot thick and dense with fibers. The reeds, my hosts explained, are hollow, so they siphon the water downward. So many layers of reeds are placed on top of one another that water never reaches the base of the thick mat. Reed roofs are making a comeback in the Netherlands—but only in the most expensive houses. Insurance premiums are astronomical, especially in forested areas. 5. Getting together with friends. I can’t believe I forgot to talk about one of the most important things I enjoyed in the Netherlands. Every evening the many town squares are packed with people sitting at cafe tables on the street sharing dinner or a beer and talking with their friends. I didn’t get a good photo of it, but picture hundreds of little cafe tables on both sides of a plaza lined with bars and restaurants. Every table is full of people. The talk and laughter go on half the night, sometimes longer. Why don’t Americans get together regularly with our friends? I asked myself. Why are we content to be so isolated? I decided to let the Netherlanders help me change my life. Friends, expect more invitations from me to get together over a beer or soda! This has been a really interesting sequence of posts. Thanks very much. I’m very interested in the fence. How long would you say the horizontal branches, and how thick, and how thick and far apart are the verticals? I guess the focus of my question is, how many uprights are horizontals woven through? The more the sturdier, but I wonder what tree the branches come from if they are several feet long and about the same degree of thinness from beginning to end. I’m also interested in the spicy green you were served. Any idea what it was? Cobalt is a very difficult color to get in photography. The way my screen is calibrated (which works for me), the greens near the blue house are themselves very bluish. If I color-corrected the green, the blue might lose some of its vibrancy. I used to do a lot of work with film chemistry, and once set myself the task of successfully photographing tradescantia (spiderwort). I shot six different color films at midday, when light was whitest. It was a very blue flower (some are purple) but to match the color of the flower, I had to print very blue because every film rendered the flower much redder, even when the green was accurate. I’ve never found out what’s so difficult about vivid blue but I’ve noticed that digital can also have problems. Hi, Diggitt, glad you’ve been enjoying these adventures. About the fence: I didn’t have time to inspect closely in person, but it looks to me like the horizontals weave through three or four verticals. I was hunkered down on the ground to take this photo, so that tells you how tall it is–about three feet, I would guess. The horizontals were placed closer than that–maybe two to three feet apart. Are you going to go build yourself one of these beauties? About the cobalt: on my screen the greens are still green, but yes, this blue was tough to get. At the website of the Open Air Museum there is a page on the blue house, but on my screen the blue in their photo looks sky blue rather than cobalt–not what it was like in person. Interesting. I wonder what it is about cobalt that’s so hard to reproduce. Priscilla, what a beautiful blog you have! I’m so glad I finally had a moment to visit your site and learn more about you and this lively earth that you write about! Thank you for including the links, photos, etc. Two of my closest neighbors are from Holland, and when I visited there (and numerous other European and British countries) back in 1965, even at the young age of 13 I was struck by the harmonious integration of agricultural local economies into the main stream culture. It was not uncommon to see goats grazing the rooftops! Page, thanks so much for your visit and for letting me know you connected. I like that image of goats on the roof! All the best in your own work to connect people with nature. I like your comment about people getting together to talk. In my neighborhood, everyone has a beautiful, manicured lawn with clipped roses and trimmed trees – but I never see a soul. People push the button on the garage door opener and disappear into their homes. I often wonder how their yards stay so nice! I’ve begun to avoid being in my own front yard for fear of being labeled as “weird!” Our only social interaction seems to be the local supercenter.